Identify the pairs: Wales and Australia; New Zealand and Scotland; France and England; South Africa and New Zealand; France and New Zealand; Argentina and France. Not particularly memorable and maybe only recognisable because of the last duo, in which the presence of Argentina reminds the Mole of their semi-final spot four years ago and their ultimate third place in the 2007 competition. Probably the most over-used truisms in a semi-final dressing room in any sport is “nobody remembers losing semi-finalists”, but it still resonates with every player who ever made it that far. Although not yet etched as dogma, part of the Mole has always considered that success in semi-finals is more connected to the coach. In general, fear plays a much bigger part of semi-finals than the prospect of success. The Mole has a fascination with experience and the role it plays in preparation for the future – for both players and coaches. Marc Lièvremont , the baby of the foursome, has only coached a team in one rugby semi-final of note, during the IRB U21 World cup in France. Success in that tournament means that he has a 100% record in semi-final coaching. However, during his playing career at Perpignan, State Francais and Biarritz he had success in Top 14 semi-finals in 1998, 2000 and 2002, whilst his last game winning game for the national team was the semi-final victory against New Zealand in 1999. Warren Gatland  coached Wasps through a Heineken Cup semi-final against Munster 34-30 in 2004 and a Parker Pen [two-legged] semi-final 61-36 against Pontypridd. He also guided Waikato past Otago in the 2006 Air New Zealand cup semi-final by 44-15. If that career looks successful, a review of the exploits of Robbie Deans  discloses a serial winner. During his 12-year stint as manager and coach of the Crusaders Super franchise from 1997-2008, Deans shepherded the Crusaders through seven Super Rugby titles and added NPC titles at random during that period. In 2000 he coached the Crusaders to a 37-15 semi-final win over the Highlanders, whom they again beat in the 2002 semi-final by 34-23, before two years in succession in which Crusaders won semi-finals but did not deliver the Super 14 trophy. On each occasion his team scored more than 30 points in their semi-final victories. Besides coaching the Crusaders to five Super Rugby titles [with two more as manager to coach Steve Hansen], Deans is a serial award winner of the the Sir Richard Hadlee Sports Trust’s Canterbury Coach of the Year and took home the New Zealand Rugby Coach of the Year Award in 2002. Graham Henry , like Deans a Canterbury man in his playing days, is the elder statesman of the semi-finalists. 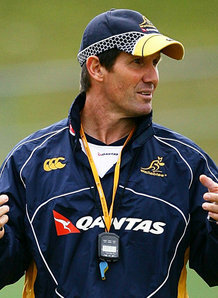 He coached Auckland from 1993-98 to four successive NPC titles and then two Super 12 titles. His subsequent return to the Blues in 2003 after his Welsh and Lions sojourns saw another success come his way. Of interest is the fact that the 2003 Blues’ win was against Deans-coached Crusaders, the only occasion the two faced each other directly in the Coaching booth. So Henry can count seven successful semi-finals of major competitions in a ten year period from 1993-2003. So, although these brief bi-ops present some two very interesting encounters, they only present part of the story. Beside Gatland are Edwards and Howley with the huge experience of Neil Jenkins in the wings. Possibly nobody has more first-hand experience of knock-out success as player or coach than Shaun Edwards, who was part of the coaching team that took Wasps to a Heineken Cup win in 2007. The League game is littered with knock-out competitions and nobody revelled in them more than the Wigan man. Among his many playing successes were the Rugby League World cup semi-final against Wales in 1995, although England went on to lose the Final to biggest rivals Australia. This four-match series certainly started well for Gatland with a Grand Slam-winning victory in March 2008 by 29-12, in which his Welsh team kept the French try-less. Shane Williams, Mike Phillips and the entire Welsh front-row survive for Saturday’s encounter whilst the French have Mas, Nallet and Dusatoir up front but only Clerc in the back-line. France: Medard, Clerc, Marty, Traille, Palisson; Trinh-Duc, Parra; Domingo, Servat, Mas, Pierre, Nallet, Dusautoir, Bonnaire, Harinordoquy. Replacements: Guirado for Servat (70), Ducalcon for Pierre (66), Pape for Mas (66), Lapandry for Harinordoquy (72), Tomas for Parra (73), Estebanez for Traille (70), Huget for Clerc (75). Replacements: Hibbard for Rees (67), Yapp for Adam Jones (52), Thomas for Warburton (15), McCusker for Thomas (71), Peel for Phillips (67), Jones S for Hook (66), Stoddart. In hindsight, Warburton’s loss after a mere 15 minutes in that end of Six Nations season encounter may have been crucial to the Welsh, although Mathew Rees was captain on the night. But the Mole remembers that week more for the media coverage of Shaun Edwards being “banned for a team indiscretion” than any other factor. This entry was posted in RWC 2011 and tagged Cuddly Warren Gatland, Dingo Deans, Graham Henry, I Am Not A Clumsy Clouseau-esque Waiter, Marc Lievremont, The Hydra by dementedmole. Bookmark the permalink.